This notion is often ridiculed and rejected by orthodox scientists, usually on the basis of thermodynamics. The thermodynamic view is that water is particulate (that is to say, divided into parts, spatially). Each of these particles (‘molecules’) is supposed to have mass, position, velocity and acceleration. The acceleration is the result of mechanical force(1) working on the particle, and each particle is supposed somehow to have gathered that work to itself as energy. The notions of “order” and “information” are important here. Any arrangement of things is an order, and a different arrangement of the same things is a different order. There is no intrinsic reason to favour any one order over any other. There may be extrinsic reasons. There cannot be two orderings of the same things at once. Thus, a change of order of the same things takes Time—and thus Time gets into the act, and becomes a player: it comes via the preservation of thingness. So let us specify an order for all the variables at time t, and call it “the ordered state”, St. We might, for example, want to have 80% of the molecules moving in the same direction and sense. If the next state, St+δt, at the later time t+δt, is different from St,, then this new state, St+δt, is automatically, by definition, “disordered”. If one or more velocities of St are not zero, the next state, St+δt , of the vectors must differ from the ordered state, St. It follows that order must proceed to disorder. Now, how is one to assess the degree of disorder, and its rate of change? There would need to be a way to compare successive states. For this, information about the states would be needed. The “aspect of communication engineering”, here referred to, had to do with the technical problems with distinguishing ‘message’ (the wanted orders) from ‘noise’ (the unwanted orders), in telecommunications. Apropos, note the use of the word, “decision”, in the specification of unit amount of information. So where does all this Will come from? Rather clearly, it is anthropogenic! The degree of disorder mentioned above is by this definition to be understood as the negative of the amount of information as Wiener defines it. This quantity is Entropy. In short, if liquid is particulate, it is supposed (rather than observed) to behave stochastically, and its entropy must increase with time. Clearly, there has been a great deal of supposition going on here! The suppositions may be correct, but the hypothesis that all this supposition is intended to support has not, to my knowledge, been rigorously tested. The study suggested here, of water flow in flow forms, may offer a test. associated with wave-creation and propagation. water and flow-form, can be expected. Resonance seems very much in evidence. The sketch above attempts to depict a way to study the behaviour of the surface of water oscillating through a flow-form. The light source should be small, and bright, and shine its light on the water's surface in such a way that its reflection from the surface are caught as a light-pattern on a translucent screen. This will allow the pattern to be photographed from behind the screen by a camera set normal to it, which should eliminate perspective problems. I guess that the pattern is bright where light has reflected from the surface, and dark where light has refracted down into the body of the water, which, according to ordinary physics, has all to do with the critical angle, which in turn implies that we are having as much to do with the orientation of planes—those “osculating” ( kissing! ) planes that are supposed to be tangent to the water's surface—as we are with position. It may be that we will have to do with both of the polar aspects of the surface. that a surface is a mathematical entity. By definition, surfaces are continuous. which by definition are discontinuous. 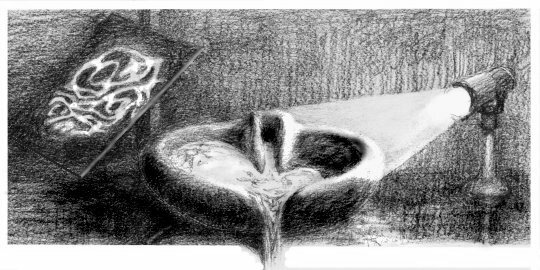 The material bulk of a flow form – its stone, clay, ceramic or composite – is not intended by design to move in response to the water oscillating between its basins, but it must move, to some degree. If a strain-guage were to be used to detect this inevitable movement—which would be as rhythmic as the water's movement, and share its periodicity—its output could, conceivably, be arranged to trigger a photograph at a specified moment in each swing-cycle. This would in effect be strobing the water's pattern. An arrangement like the one in the diagram below might work. The slight ‘rocking’ of the form would deform the rubber base to which it is attached, and with it the guage. The output waveform may not be quite as simple as the near-sinusoid depicted here! The pattern does not appear to the eye to repeat exactly, but it may nearly do so, in the sense that the samples might change from one to the next in some regular, incremental fashion, a bit like precession—or the changes might be chaotic, which, it must be stressed, does not imply that they are random (i.e., stochastic). Strobed sampling should cast some light (sic) on the issue. Which geometry applies? Does any apply? Light is often said to radiate: it is thought to travel as “rays”, which are lines, and to come from a source, or centre, which is a point. In other words, light is conflated with geometry and number, despite the fact that neither geometry nor number is light. Curious juxtapositions, like this one, of concept and phenomena are ubiquitous in physics, and rife in exact science generally. λ1 and λ2 are “wavelengths” - of waves that are not in evidence. i and r are angles, of incidence and of refraction, respectively. There is some geometry here, but it is not pure projective geometry, and there is a lot of Euclid, without which, of course, there could be no associated, numeric mathematics (i.e., the trigonometry)—but conspicuously absent from the diagram are the actual light, and the actual media, under discussion. Phenomenology this is not. Goethe would not approve. So a strip of plane, as noted, is our light. 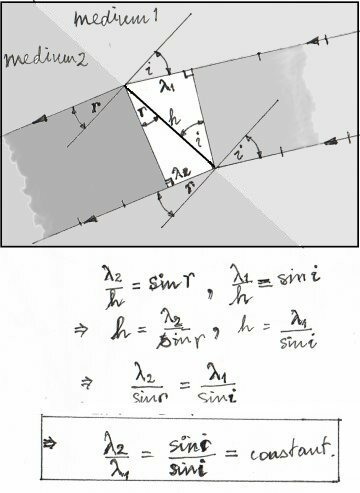 But that strip is just a device to allow the common hypotenuse (h, in the diagram) of two right-angled triangles to exist, because that hypotenuse is needed to facilitate a bit of trigonometry involving those triangles. This trigonometry eventually produces a constant ratio of sines–which is a number–and presumably we are to infer that the light/media combination produces such a ratio, too, for all that these components are neither geometric elements, nor numbers. Mechanical force has several possible origins (electromagnetic, gravitational, ...) but force itself seems to be the same whatever its origin. In other words, force itself contains no information about the nature of its source. Why not? However, an extremely promising beginning was made by NickThomas.